Tug of War is the first book of its kind. Written by a sitting family court judge in laymans language, it demystifies complex family law concepts and procedures, clearly explains how family court works, and gives parents essential alternatives to resolve their own custody battles and keep their kids out of the often damaging court system. Breakup rates in North America are skyrocketing. Recent statistics say 45% of marriages end in divorce, and at the centre are countless children, thrust by their families into a complex and seemingly impermeable family court system. 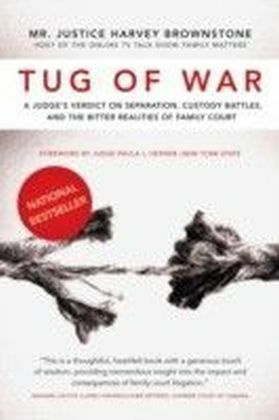 Tug of War explains the role of lawyers and judges in the family justice system, and examines the parents own responsibilities to ensure that post-separation conflicts are resolved with minimal damage to the children stuck in the middle of parental disputes. Justice Harvey Brownstone explores themes that apply to all families and parents in conflict. He draws on fourteen years sitting on the family court bench to provide clear case examples with inclusive and accessible language. Tug of War describes alternatives to litigation and exposes the myth that parents can represent themselves without a lawyer in family court. Justice Brownstone discloses the inner struggles of parents, judges and lawyers in the maelstrom of marital conflict. This book is a must-read for couples involved in or contemplating separation, family law judges, lawyers, mediators, parenting coaches, psychologists, family counselors, social workers, students and professors of family law at law schools. It is endorsed by judges currently sitting in Ontario and New York State.